You've heard the saying...What's old is new again. Well, a new restaurant in an old building in Pass Christian is busy again, especially at lunch. Old Cuevas Bistro and Bakery is on Menge Avenue in the Pass. Growing up, Cassandra Timmons and her family vacationed in South Mississippi. Now, they live here and run their family business. Timmons says, "My brother built it, my father found it and helps work in it all the time. My cousin works with me everyday, my sister and my two nieces behind the bar." 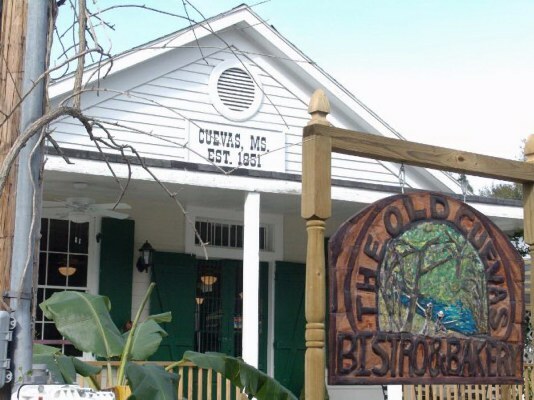 Old Cuevas Bistro is located in one of the oldest general stores in South Mississippi. It was established in 1851. The Bistro opened the week before Thanksgiving, 2004. and business has been booming. Timmons couldn't imagine doing anything else. "Yeah, I put my heart and soul in it. I mean, I love cooking," Timmons says. And you can taste it in her food. The recipes also come from her heart. Timmons says, "I just kind of read, take recipes change 'em up and do like that. I don't really have any recipes. We don't have any written recipes." Timmons says she loves coming up with new entrees. "Blackened catfish with shrimp in a fresh herb butter. That's the special for the day," says Timmons. So, whether it's one of the daily specials, the Blue Corn chicken entree or one of quite a few salads, your taste buds will be delighted. The one thing Timmons doesn't do... "I don't do any of the dessert baking. I'm not a very good baker. Latrese over there does all the baking for us," Timmons says. Old Cuevas Bistro and Bakery is located on Menge Avenue in Pass Christian in the Old Cuevas Store. It's open for lunch 11am until 3pm Monday through Saturday. Dinner is served from 5pm until 9pm Tuesday through Thursday and 5pm until 10pm Friday and Saturday. They are closed Monday evenings and all day Sunday.